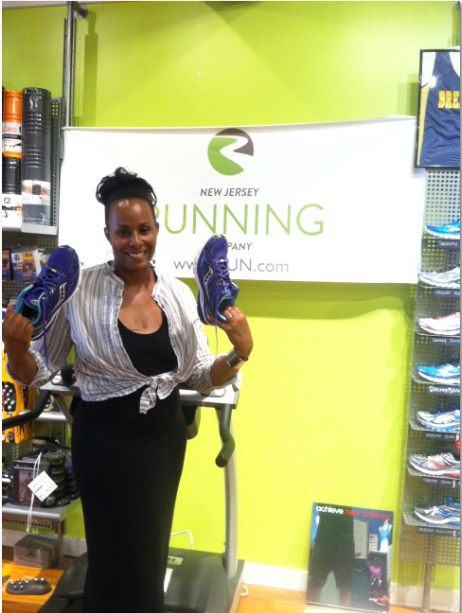 One of our awesome patients, Kimbely Racine, won our "Running Selfie" contest held in honor of National Running Day. In honor of National Running Day, Family Foot & Ankle Specialists held a contest on Facebook encouraging their followers to post a running "selfie" on their page. The picture with the most "likes" would win a free pair of running shoes. A patient at the office, Kimberly, posted her picture to Family Foot & Ankle Specialists' Facebook wall. With all of the support of her friends, family, and running club, Kim was the winner! Family Foot & Ankle Specialists are dedicated to keeping people on their feet. The podiatry office, located in Piscataway and Hillsborough, NJ, treat all foot types from children to seniors with problems ranging from toenail and skin problems, children's feet, diabetic feet all the way to sports injuries and everything in between. "Prevention is the best way to treat any foot problem," explains Dr. Wishnie. "Most foot problems can be prevented with education and the proper tools." Shoes are the first defense in sports injuries effecting the feet. Proper running shoes are vital in protecting your feet from common running injuries. As a runner himself, Dr. Peter Wishnie understands that runners, and athletes of any kind, dread being told to keep off their feet following an injury. Learn more tips on preventing injuries!